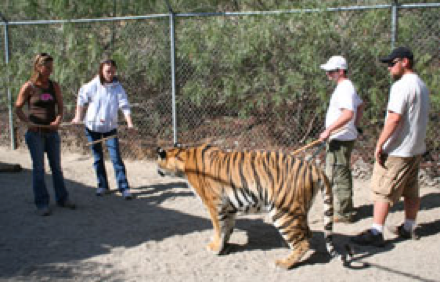 Hollywood Animals is a Santa Clarita, CA exotic animal rental business which trains big cats and other exotics and then “rents them out” for special events, movies, TV, and advertising. 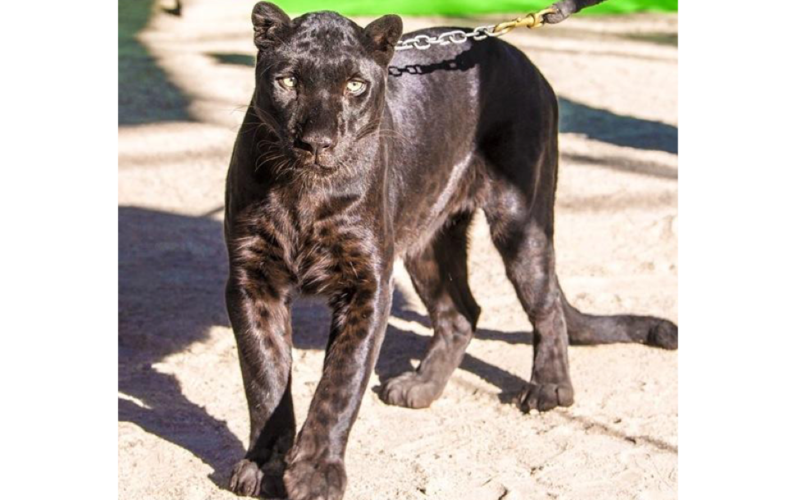 They make the dangerous claim that their big cats are perfectly “safe” working with untrained actors and operate a bogus “Exotic Animal Training School” which promises to turn paying members of the public into animal trainers in just two weeks via reportedly illegal and extremely dangerous hands-on interactions with their adult big cats and bears. 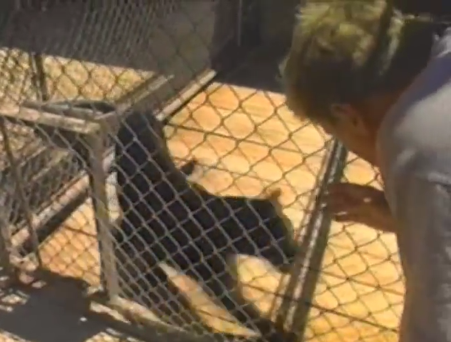 Hollywood Animals has been written up by federal inspectors for failure to maintain records on euthanized/transferred big cats, failure to provide animals with potable water, withholding food from animals, and endangering the public by selling hands-on animal encounters with large carnivores in direct defiance of multiple USDA orders. They have also had at least two animals escape from their facility. 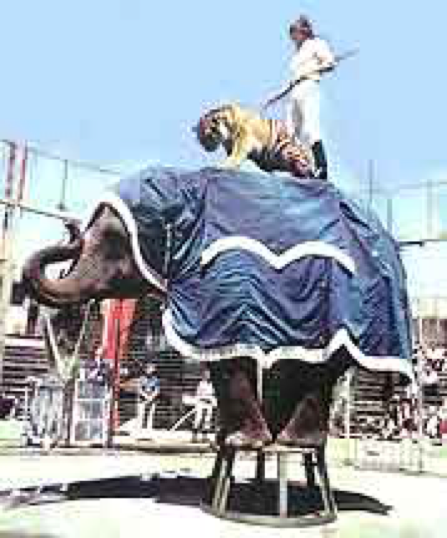 Both Ringling Bros. and Marine World Africa USA have appalling records of animal abuse, and McMillan’s mentor, Gunther Gebel-Williams, has been caught whipping animals in the face, striking elephants with bullhooks, and as director of Animal Welfare for Ringling Bros., ignoring veterinary advice by forcing extremely sick animals to perform until they died (and then covering up the deaths). McMillan himself was a lion trainer for Ringling Bros. starting in 1970. His group of 7 lionesses and one male lion were forced to jump through flaming hoops, stand on their hind legs, play “leapfrog,” and dance. 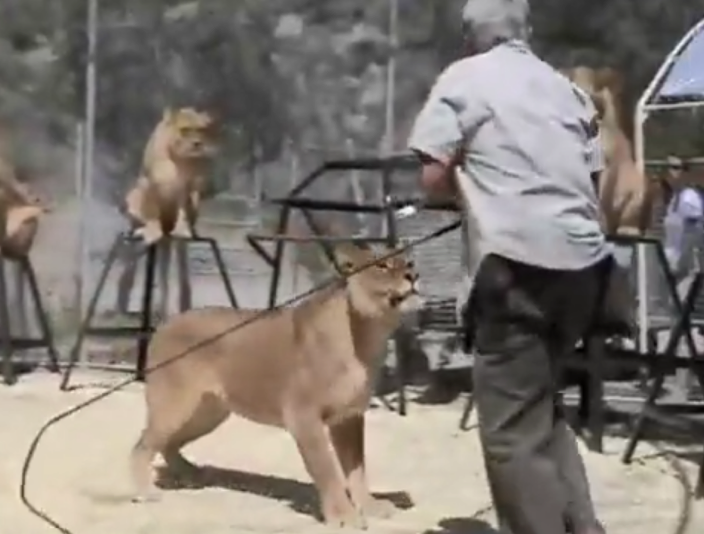 McMillan toured with his group of performing lions in Ringling’s Gold Unit in 2010.
a panicked lioness frantically trying to escape a tiny cage while being used as a prop in a noisy magic act. 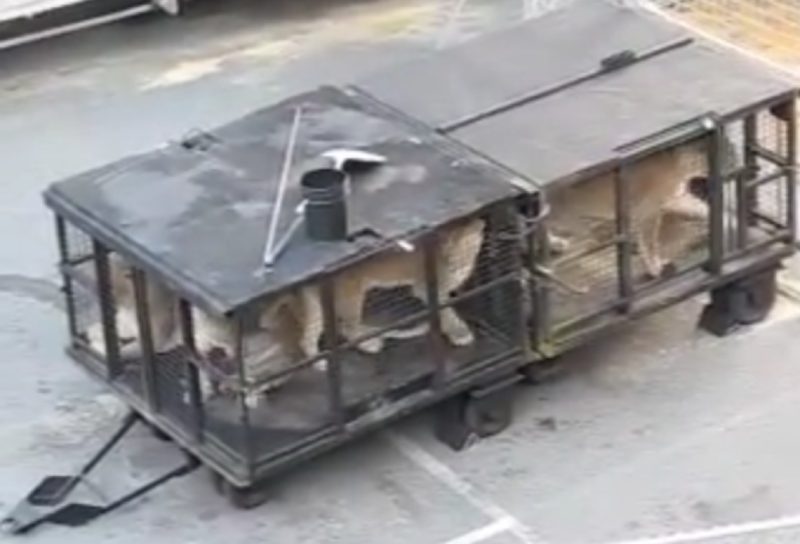 After the show, all 7 lionesses were crammed into a tiny transport cage where they were seen pacing in tight circles. 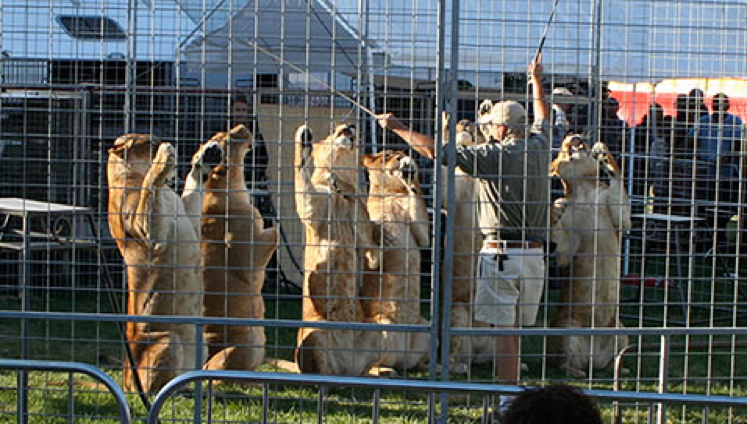 McMillan’s 7 lionesses pacing in their tiny transport crate after a 2010 Ringling show. 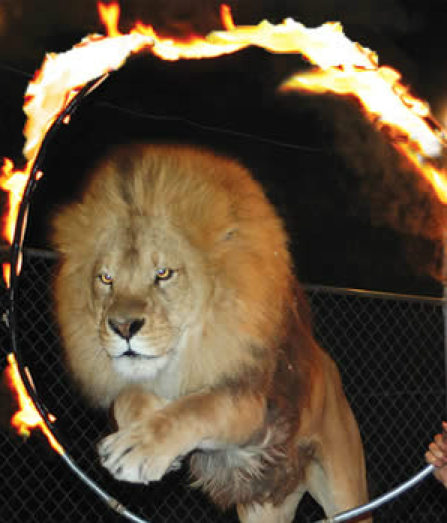 McMillan’s lion jumping through a flaming hoop at a circus. One of McMillan’s animal acts at Marine World Africa USA. This video, uploaded by McMillan to promote Lufuno, reveals that the lion was purchased as a cub from a park in South Africa (which probably told tourists that they were “conserving lions.”) It includes footage of McMillan holding a whip and a wooden rod while working with Lufuno, and an inexplicable scene of one of McMillan’s associates riding on the lion’s back, which can’t possibly be good for the cat’s spine. 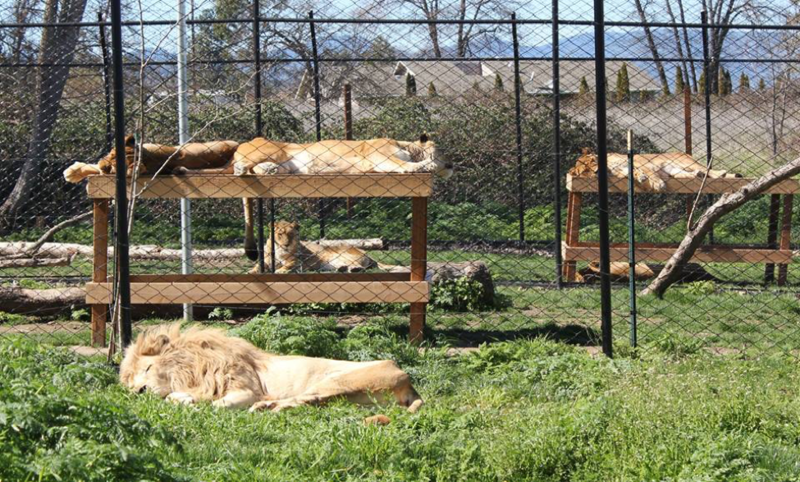 In 2013, after leaving Hollywood Animals in the hands of Eric Weld, McMillan moved his lions to a suburban Southern Oregon property, within a 1 mile radius of approximately 5,000 homes and 4 schools, including an elementary school. He intended to continue renting them out for film work and opened a bed and breakfast called “Walking With Lions,” where guests could view and feed the lions through the chainlink fence. But because the property was not zoned for “commercial use” of exotic animals, McMillan was forced to move back to California in 2015. McMillan’s former “Walking with Lions” facility in suburban Oregon. Note the houses in the background. 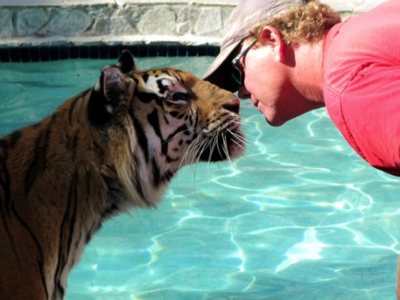 Hollywood Animals claims to use the nice-sounding “affection training” to train their big cats. But this video uploaded by Brian McMillan reveals that “affection training” means ripping newborn cubs from their mothers and bottle raising them in a home so the cubs are forced to “bond” to trainers instead. Eric Weld has continued this practice and has confirmed that cubs are usually purchased from private breeders. McMillan and Weld claim that the unnatural imprinting process creates “a close relationship based on trust and respect,” and that it allows his adult big cats to have full contact with untrained cast and crew “with complete safety,” a dangerous lie. 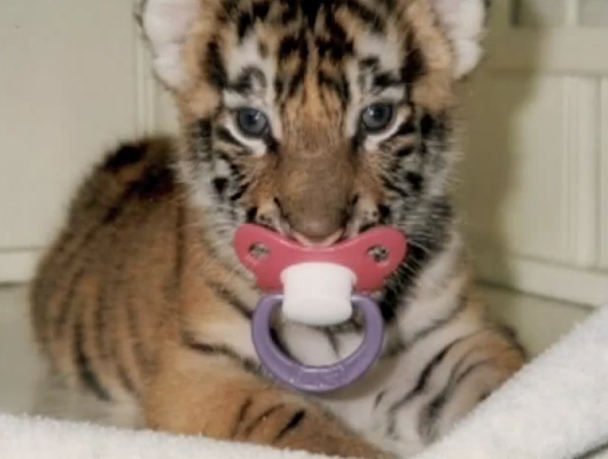 A baby pacifier is a cruel replacement for this cross-eyed cub’s mother. Photo from McMillan’s Youtube channel. 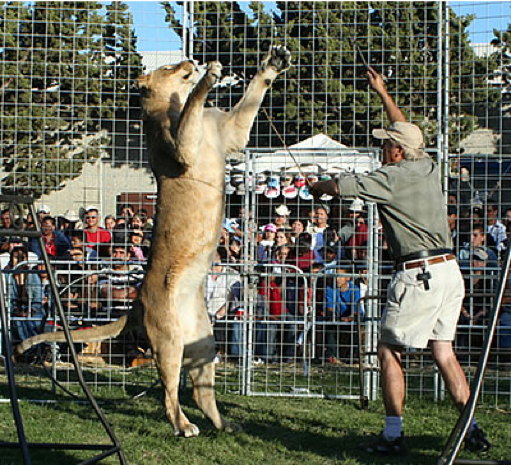 Although Hollywood Animals advertises “humanely trained animals,” videos taken at their compound routinely show McMillan and Weld training and “working” the big cats with whips, rods, and pointed sticks in hand, just like during McMillan’s circus days. 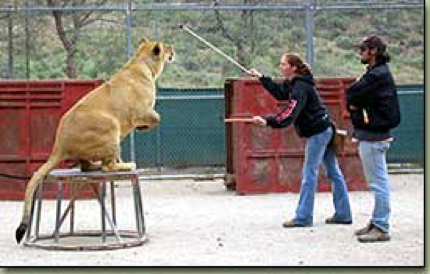 McMillan at Hollywood Animals, training lions to stand on their hind legs by waving a whip over their heads. Note: This is not the same “Romeo” that was beaten by Sid Yost, another Hollywood trainer. Note: The USDA demanded that Hollywood Animals immediately stop selling photos with their big cats, but this same citation was repeated in March 2009 with no consequences. 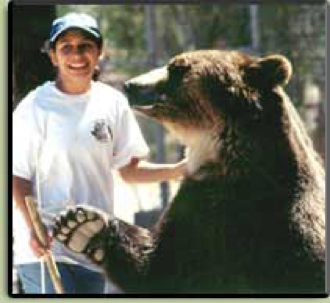 The USDA declared this problem “corrected” in a May 2009 inspection report, but Hollywood Animals continued to promote their “trainer for a day” encounters, including encounters for children as young as 8, on their website until at least 2011. 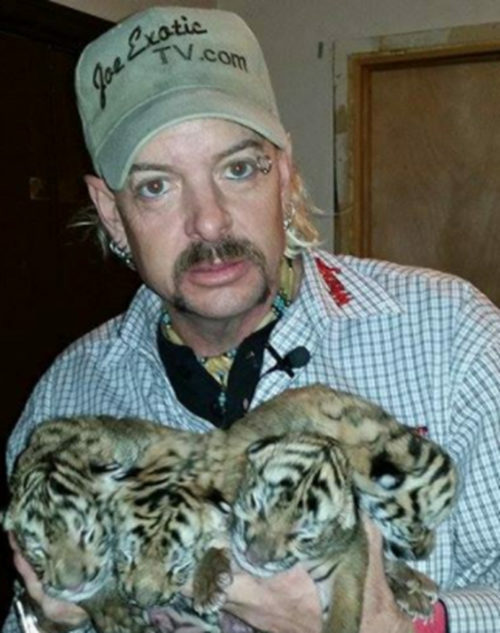 There is convincing evidence that Hollywood Animals still sells dangerous “animal encounters” to this day — a 2016 episode of “Hell’s Kitchen” featured the show’s contestants petting and feeding an adult tiger while taking part in a Hollywood Animals “training class,” a 2016 episode of the Nickelodeon program “Jagger Eaton’s Mega Life” featured their 16 year old host “training” a 700 lb. 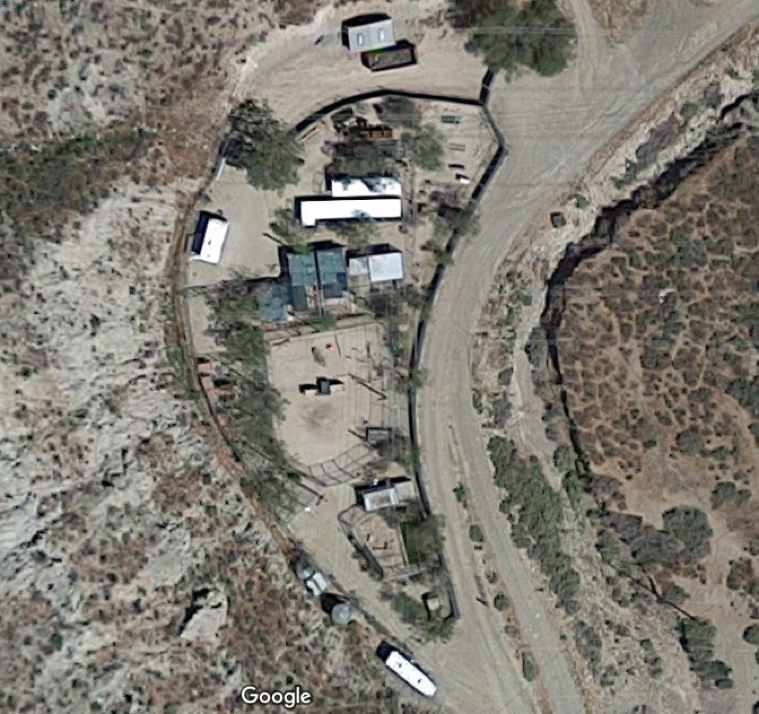 grizzly bear at the compound, and the link advertising Hollywood Animals’ “Animal School” remains on the company website. A “behind the scenes” site for a Bollywood film that used Hollywood Animals’ tigers reported that one of the cats had to be exposed to blasting loud rock music “or she wouldn’t perform.” This site also includes pictures of Weld carrying a bamboo rod while working with the tiger on-set. Felix sweltering in a cage at LMU. Here are several videos of Felix being used as an ego prop in the yard of a mansion for a DJ Khaled rap album. For a brief moment in one of them, you can see Weld lunging towards Felix (“contained” by a thin electric fence) with a pointed metal stick. Here’s a video, uploaded by McMillan himself, of Felix being taken out of his cage by handlers wielding sticks before being dressed up in a demeaning, clown-like party hat, bowtie, and bib for a commercial shoot. In the mid to late 1990s, several wallaroos escaped Hollywood Animals’ compound, confusing local residents. This article also mentions that although Hollywood Animals is “not technically open to the public they have seminars, private parties, corporate events, and animal training courses and classes. According to their website, the seminars cost $100 per person or $190 per couple and last for about 4 hours. 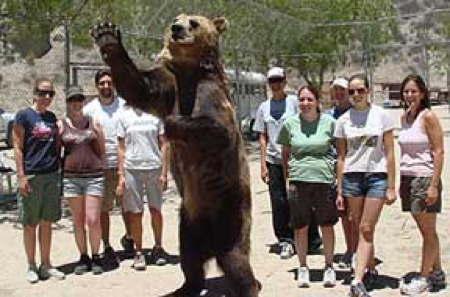 You would be in a group of about 20 to 30 people and get a behind the scene look at the animals.” This is likely a reference to the bogus “animal training seminars” where McMillan allows the general public to pay big bucks for the (illegal) opportunity to pet and pose with his adult big cats and bears, despite repeated USDA orders not to do so. In this 2011 article, a journalist who visited Hollywood Animals took part in their 16-and-up “trainer for a day” program, overseen by Eric Weld in direct defiance of two USDA orders to cease public contact with dangerous carnivores. In a shocking disregard for public safety, Weld allowed the journalist to enter the enclosure of an unrestrained 350 lb. tiger and give “sit and stay” commands to the cat, before having him feed a 600 lb. grizzly bear named Bam Bam marshmallows and gummy bears out of his mouth (Weld warned “if you pull away at the last second, Bam Bam will claw at the marshmallow — and your mouth”). 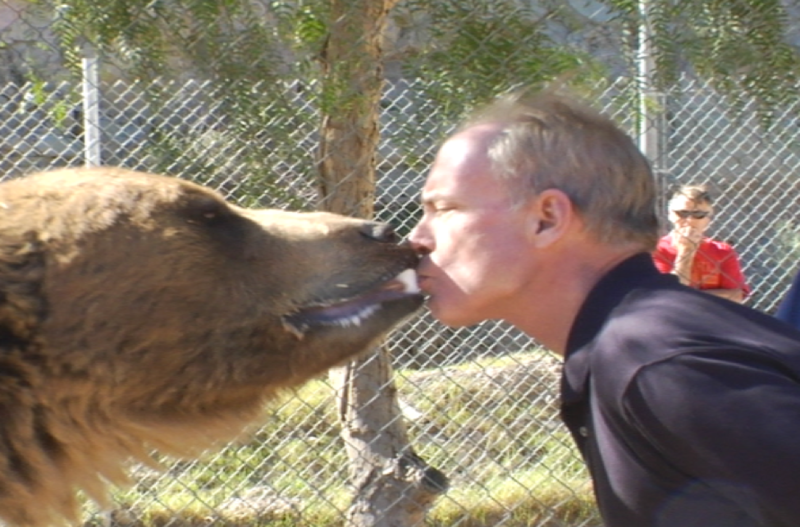 An untrained journalist “kisses” a grizzly bear at Eric Weld’s compound. Does this look like a good idea? In 2009, Hollywood Animals applied for US Fish and Wildlife Service permits to travel overseas with 2 leopards for the purported purpose of “enhancement of the species through conservation education.” The real purpose, of course, was movie filming. 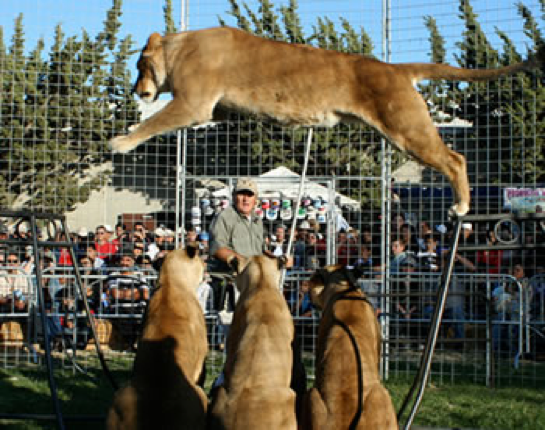 Around 2007, Brian McMillan loaded eight lions (7 females and 1 male) into a 33 foot long stainless steel travel trailer and took them on the fairground circuit with his “Walking with Lions” show. The show, which is now defunct, dragged the lions across North America to 10-12 performances per season, some as far away as Winnepeg and Hawaii. It was essentially McMillan’s circus act with a thin veneer of “educational” content used to justify the unnatural tricks the cats were being forced to do. The lions jumped through hoops to “demonstrate their agility” and showed “an example of teamwork” by all standing on their hind legs simultaneously as McMillan snapped a whip over their heads. 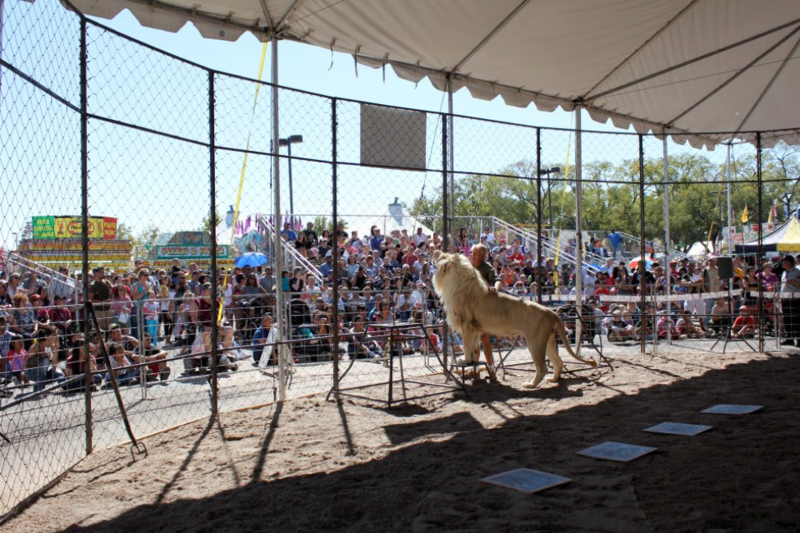 When not performing, the lions were housed in a 48 foot long “display trailer” to be gawked at by fairgoers. 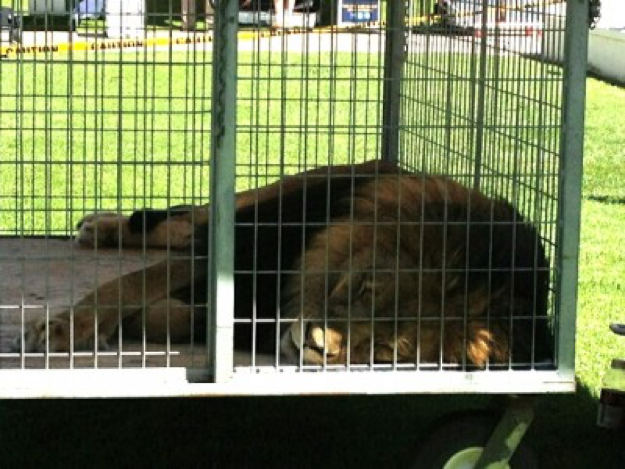 According to the official website of the show, McMillan charged over $10,000 to each fair that hosted his lions. Lufuno, McMillan’s prized white lion, during a fairground performance. The 33 foot long trailer used by Brian McMillan to haul 8 lions to fairs as far away as Hawaii and Winnipeg. Caged tigers at the 2008 Gold Country Fair. A chained black leopard posing with a model for a Harpers Bazaar photoshoot in 2013. 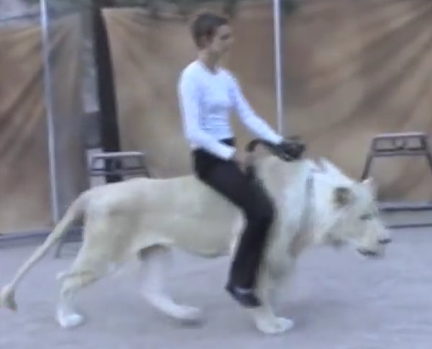 This live lion (probably Felix) was used as a prop in a Beyonce music video. 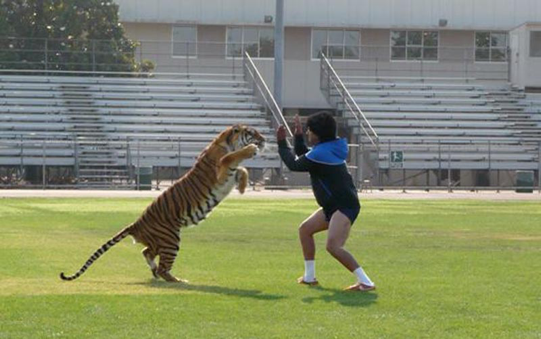 One of Hollywood Animals’ tigers in a Nike ad. Felix again, being treated as a pet in an ad for Ritz-Carlton. “Nikki,” a black leopard, on set. Hollywood Animals is based from a rural 8-acre compound in Tick Canyon, Santa Clarita, CA. 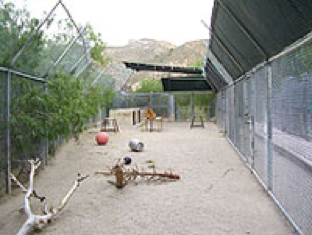 If these pictures from McMillan’s website and videos are anything to go by, the cats live in fairly barren chain-link enclosures devoid of vegetation. 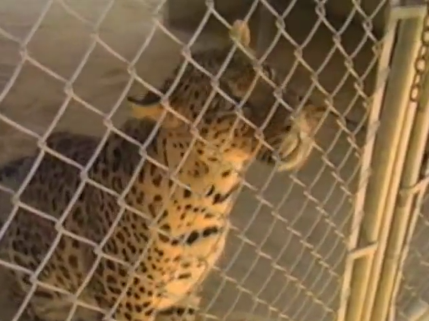 In this video, you can see leopards pacing in rows of small concrete-floored pens. An overhead view of Hollywood Animals. Is that a tiger to the left of the red ball in the center pen? 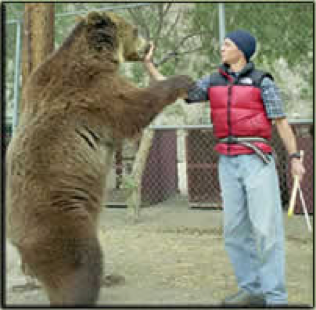 Photos of the public being put at risk by Hollywood Animals’ illegal “trainer for a day” programs, “private animal encounters,” and bogus “seminars,” taken from their archived promotional website. Program participants, some as young as 12 years old, have paid McMillan and Weld anywhere from hundreds to thousands of dollars for the dangerous privilege of patting and “working with” their large carnivores, despite having had no previous training or experience whatsoever. 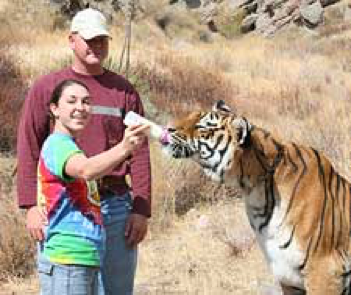 The experience was advertised as an “animal lover’s dream” and participants were urged to “bring your kids.” Some of these photos were taken as recently as 2007, and Weld mentioned in a 2009 article that “about one to four people a month pay the $600 for a personal animal encounter, usually with bears or tigers.” Profit, not safety, is clearly the motive here, and despite USDA orders to stop endangering the public in this manner, there is evidence that these dangerous encounters are still being sold by Weld “under the table”. What company would want to work with a business that has such clear disregard for human safety? 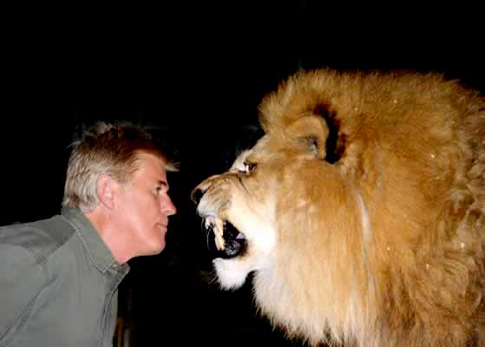 Also goes by the name Brian McMillan and tours under the name Walking With Lions at fairs. 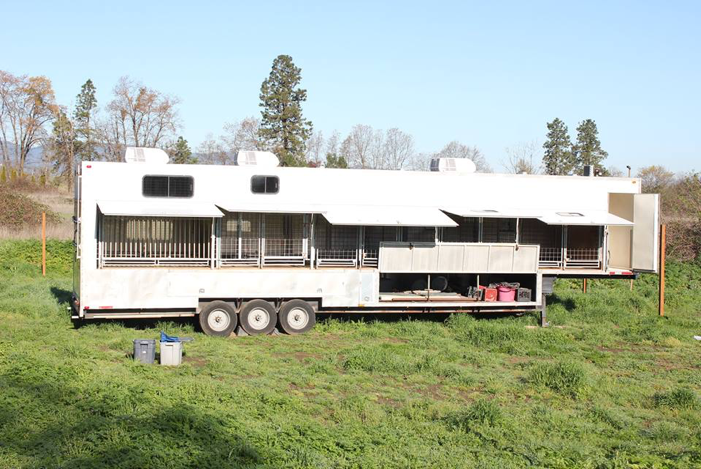 2015 Update: Brian and Vikki McMillan packed up their lions and moved back to California after being denied permits to continue using the lions for commercial gain in Oregon. The news article did not say where the lions were going. Maybe back to the P.O. Box? 1902 Houston Road Phoenix, OR where Brian McMillan has requested that the Jackson County Development Services interpret his breeding and commercialization of wild animals to be permitted under “farm use.” The application says he plans to bring 7 lions and assorted other wild animals from Canyon County, CA to Jackson County, OR. This 41 ac site borders or is within a 1 mile radius of 5,000 approximately residences, businesses and 4 schools. According to those who live in the area, the real disgrace is that none of the schools, library, the police, the sheriff’s department, fire chief, retailers nor residents were informed that a wild animal attraction was opening in their neighborhood. 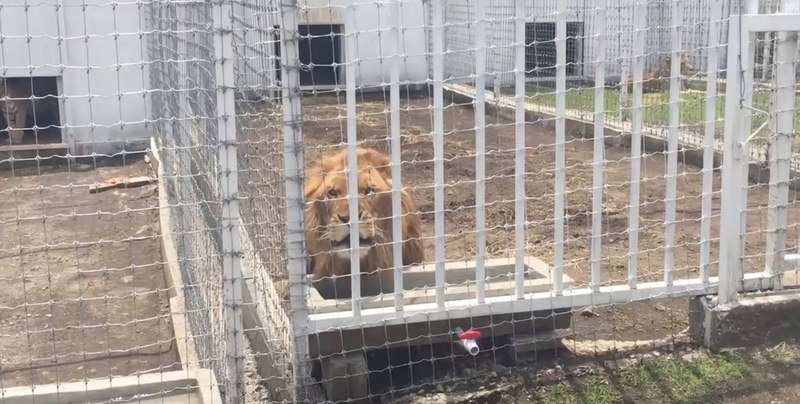 It has been suggested that the Jackson County Development Services may have tried to block McMillan from bringing the lions under the “farm use” loophole, but that McMillan is stating that USDA gives him the right to have them; so no one can stop him. This is a common ploy used by those who own exotic cats to circumvent local prohibitions on big cats as pets. A one page application and $40.00 can get them a USDA license, which makes them “an exhibitor” or a “breeder” thus circumventing laws that prevent their “pets.” In 2010 the Office of the Inspector General audited USDA and found that of the licensees, who held four or fewer big cats, 70% were just pet owners who obtained this easy-to-get license in order to get around local bans. This is why we need a federal ban on the private possession of big cats. Hard to believe anyone could think there would be anything good or redeeming about a place that rents out lions, tigers or any other wild animal. Nov 13, 2013 PHOENIX, Ore. — Giraffes, zebras, and even some lions, are moving in next door to a Phoenix neighborhood. The owner says the animals will bring big business to the Southern Oregon town, but others have concerns about how close the animals are to people. A Hollywood animal trainer says he wants to bring the operation to Southern Oregon because he loves the land and loves the climate. The 41 acre property sits near homes, schools and businesses, and Oregon laws about exotic species allow them to be there. North Houston Road is like many areas in Phoenix, home to scattered neighborhoods, farms, and businesses. Coming next year, that area gets some wild new tenants. 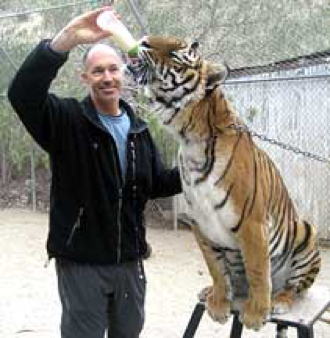 Hollywood animal trainer Brian McMillan is moving his operation from Southern California to Phoenix, where he will raise and train several exotic animals, and put on educational programs. “We will have programs here where we can have school kids in, and also members of the public who are interested in learning about game farming,” says McMillan. He plans to bring those hoofed animals, and is trying to get approval for seven lions. That came as a surprise to some of its neighbors, including Phoenix High School, which is right next door. Principal Jani Hale says she’s neutral about having the animals next door, but she does worry about loud noises from football games startling the animals. Many neighbors NewsWatch12 spoke to said they’re not worried, and are excited about the program. So how can giraffes, zebras and lions move in next door? In Oregon, animals like zebras and giraffes fall are considered “non-controlled species” by ODFW. 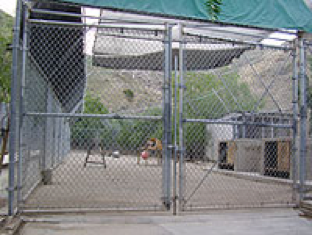 No agency inspects them, and there is no minimum fencing requirements, and lions are regulated by the USDA. In California, laws are getting stricter. 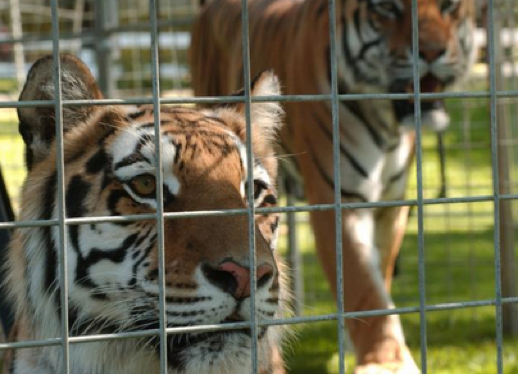 In September, West Hollywood banned exotic animal shows. Huntington Beach and Pasadena also have similar bans. McMillan has run his “Walking with Lions” shows for years at parks and circuses, but he says the changing laws are not influencing the move to Southern Oregon. McMillan also says he follows federal fencing and safety guidelines, to make sure nothing gets out. McMillan says after seeing so much support from neighbors, it’s a project he hopes other Phoenix residents will approve of. “We really do want the community to get behind this,” he said. The USDA does routine inspections on lions. 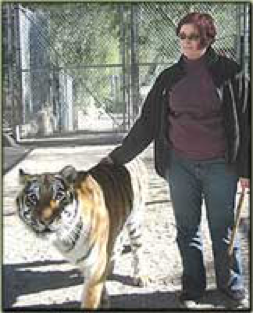 They issued a reports in 2008 and 2009 saying McMillan was allowing the public to get too close to the big cats. They said the issue was corrected, and McMillan has had no violations for the past two years. Although this ban doesn’t directly effect Brian McMillan, it is obvious that Californians are becoming more aware of animal sentience and less tolerant of animal exploiters. 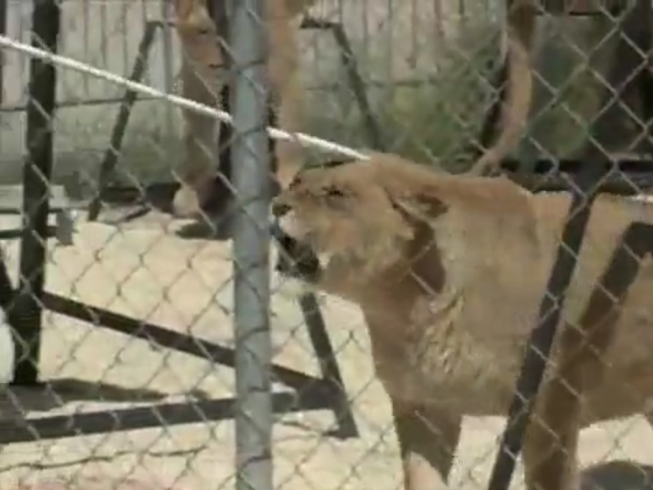 PHOENIX — A Hollywood trainer of lions and other exotic animals says he plans to open a satellite operation near Phoenix to serve as a home base for his Oregon filming and as an education center. Lions, giraffes, zebras and a host of African antelope could be living a year from now in new facilities that trainer Brian McMillan plans for his property along Houston Road adjacent to Phoenix city limits. McMillan and his wife, Victoria, in August bought a 41-acre parcel of farmland and are now renovating the century-old farmhouse on the property — the first phase of his planned operation. McMillan has been an animal trainer for more than 30 years, according to his website. His credits include television shows such as “CSI: NY” and “Monk” and films such as “Into the Wild,” as well as an array of talk shows and television commercials. McMillan said his “Hollywood Animals” and “Walking with Lions” operations already do filming in Oregon, primarily in the Portland area, and he wants to expand that work in Oregon and Northern California. The couple settled on the Phoenix property as a base for filming here because they prefer the climate and the community, he said, but that they plan to keep his Southern California operation as well. Eventually, he plans to add pens and other facilities on the property before shipping seven lions, three giraffes, three zebras, two camels, two ostriches and six antelope north, according to his county planning application. The lions fall under the jurisdiction of the U.S. Department of Agriculture and would need a permit from that agency to be housed on the property, said Bruce Pokarney, spokesman for the state Department of Agriculture. The ostriches and camels already are exempt from wildlife laws because they are considered domesticated animals, said Rick Boatner, who handles exotic species issues for the Oregon Department of Fish and Wildlife. The giraffes, zebras and the antelopes — kudus, blackbucks and impalas — are listed by the ODFW as “non-controlled animals” that can be kept, bred or sold here under limited restrictions, Boatner said. There are not even fencing requirements such as those for keeping bears or cougars, Boatner said. Under state statutes, any escaped exotics must be reported to the ODFW within 24 hours, and the owners have 48 hours to capture them, Boatner said. After that, any police officer or ODFW biologist can capture, seize or kill the escaped animal, he said. “They can do whatever they think is best,” Boatner said. All the animals must get an ODA health certificate before they can enter Oregon, Boatner said. “It’s very rare, outside of zoos, to bring these animals in,” he said. Reach reporter Mark Freeman at 541-776-4470, or email at mfreeman@mailtribune.com.